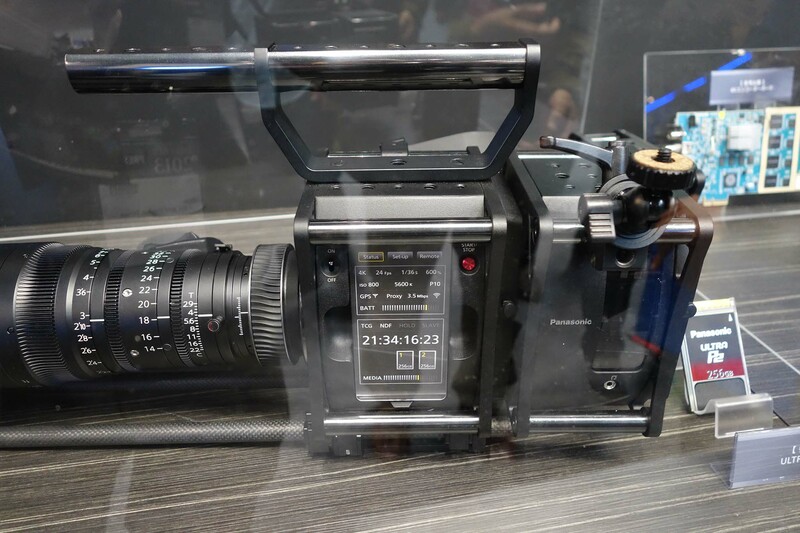 Panasonic’s prototype 4K Varicam 35mm sensor camera, seen at IBC, was shown again under glass at InterBEE. The plethora of rods surrounding the body seem to be intended as grab handles and mounting points for gobo heads, Mafer clamps and car rigs. Nearby, Panasonic’s new Toughpad 4K UT-MB5 tablet was on display. 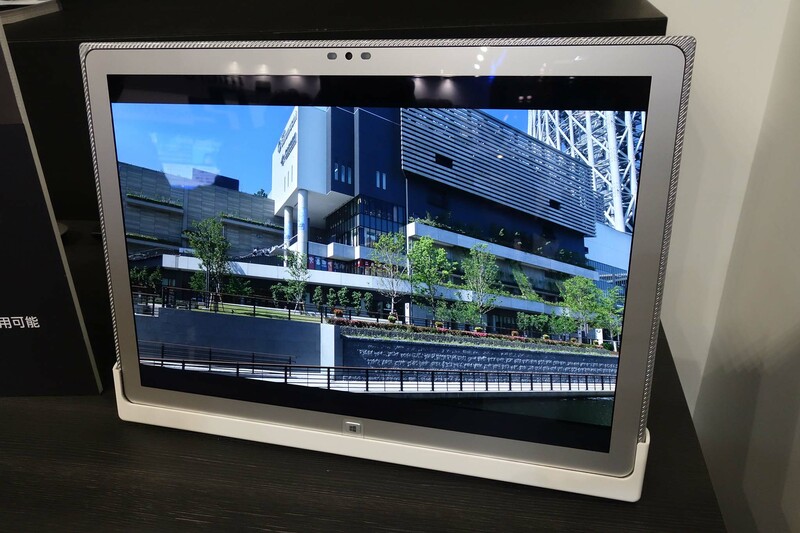 The 20-inch 4K Toughpad tablet is intended not just for video, but also for an even larger market in design, photography, architecture, engineering, museums, galleries, retail stores, and healthcare (reading X-Rays). It was especially good at displaying fine text, diagrams and detail. The Toughpad 4K UT-MB5 has a 3840×2560 pixel display, 230 pixels per inch, 15:10 aspect ratio. (By way of comparison, a 9.7 inch Retina iPad is 2048 x 1535 at 264 pixels per inch. So, the benefit of 4K is a bigger picture, up close. In addition to its touchscreen , the Toughpad 4K can be used with an optional pressure-sensitive Electronic Touch Pen for freehand sketching or writing. The pen works with infrared and Bluetooth to individual pixel accuracy. The optional Panasonic desktop cradle lets you use it as desktop PC and tablet. The cradle has USB 3.0 x3, Ethernet and HDMI-output. The Toughpad 4K UT-MB5 adds to Panasonic’s expanding line of 4K products, including the 65-inch VIERA® WT600 Ultra-High Definition 4K TV and the BT-4LH310 LCD production monitor. The Toughpad 4K UT-MB5 will be available in January 2014 at a list price of $5,999. It would be really nice to see a proper full blown studio interface in both HD and 4K out of this camera as more TV productions are going the large sensor aesthetic for news, variety and interviews. Plus maybe a nice “box lens” type piece of glass which is S35 compatible…with maybe a 20:1 ratio to get the ball rolling. I’m very excited about this news, and cannot wait for Panasonic to release the GH4, 4k camcorder, and 4K tablet. I mainly shoot large event stuff and the thought of updating to to 4K and wireless is something I am looking forward to. The only frustration is the wait. Until then I am still shooting with my HVX cameras which have never missed a beat. I like the HVX form factors the best. I also have a young team of assistant camera operators and they love DSLR’s. So they grab cutaways and close ups on the fly. So a couple of GH4’s will nicely add to the kit.